Sometimes having a kid brings unexpected benefits. In this case, my two-year old, Otto (known for his Porsche-hood-standing skills) is friends with another two year old, Lino, whose mom is a friend of my wife, and who is married to a man whose father happens to be 1970 LeMans winner and all around racing legend Hans Herrmann. That's how I ended up with Herrmann in my humble living room, talking about his long, lucky, racing career. Herrmann's nickname in racing was Hans im Glück which means, basically, "Lucky Hans" because of his remarkable ability to not get killed in the many close calls and accidents he had. This combination of luck and speed seems to be a constant in his life, starting with a lucky sprint away from the Russian front when he was conscripted, at 16, into the desperate remains of the German army at the end of WWII. Herrmann raced as a privateer, for Abarth, Mercedes-Benz, and Porsche, giving Porsche their first LeMans win in 1970. There's so much good stuff to talk about with the man, and luckily he enjoys talking about his long career. These are very informal videos— just a hand-held camera, Hermann sitting and talking in mostly German but sometimes some English flows in there. His son, Dino, helped with some translating, and while not everything got translated, it's surprisingly easy to understand what's being said. Watch and see— it was a huge privilege to get to talk to this racing legend in such an easy and open context. First clip: Here I ask Hans about his very first cars, and how he got started in racing. Second clip: There's a great story about a 1954 race and an oncoming train. Hans explains it all here. Third clip: I ask Hans about a terrifying and famous picture of him, and get the full story behind it. Fourth clip: This part may be my favorite. 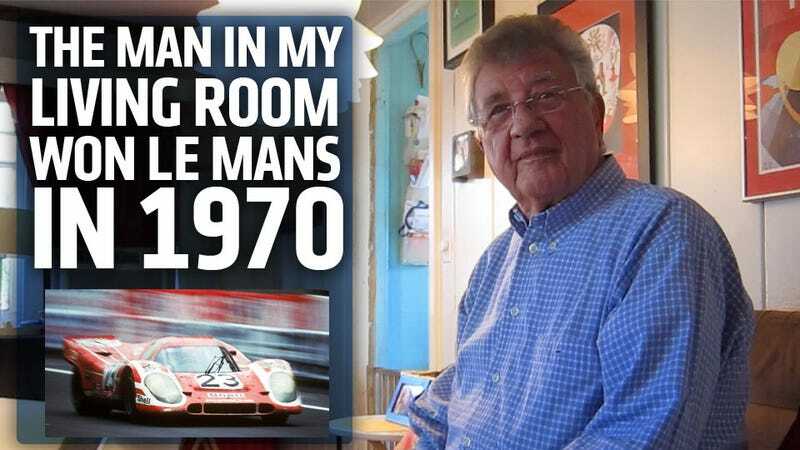 I ask Hans about his roughy one-second loss to Jacky Ickx at the 1969 Le Mans. Fifth clip: I ask Hans about driving the legendary and often terrifying Porsche 917. Sixth clip: Herrmann retired from racing after his Le Mans win, citing safety concerns. I ask him about how he thinks things have changed, and if he'd have retired if he was in racing today, with modern safety equipment.